In Uganda, on the banks of the Nile, Megan Iacobini de Fazio dives in to Tanzanian singeli, electro acholi and Ghanaian EDM. The Nile Discovery Beach resort has certainly seen better days, but the crumbling pathways, which weave their way through the lush tropical forest into sunlit clearings, up crumbling staircases and past dilapidated buildings, somehow add to the peculiarity of this event. For three days, thousands of people – variously garbed in bright print, psychedelic facepaint and fancy headgear – slipped, stumbled and tripped their way around the muddy venue, between the four stages and the many hidden chill-out spots. On the line-up: traditional percussion troupes, young self-taught EDM producers, traditional wedding singers who have reinvented their ancestral music with computer software. More than 200 artists travelled from across the continent, with South Africa, Ghana, Democratic Republic of the Congo, Kenya, Tanzania and of course Uganda all well represented. Labdi is not the only one making up new genres of music. For over decade, the sprawling working class neighbourhoods of Dar Es Salaam have been bubbling with creative energy, giving birth to various micro-scenes and new musical genres largely unknown outside of Tanzania. The MCs and beat-makers from Sisso Records travelled for over 30 hours by bus, crossing two land borders, just to debut their unique Singeli sound to an international audience of Nyege Nyege. “Singeli is a style that combines music from different parts of Tanzania, but all chopped up and changed around,” explains Abbas Jazza, the young managing director at Sisso. “It started as an underground movement but now it is becoming the national music of Tanzania’s youth.” When they finally take to the stage on Saturday night the audience is initially taken aback by the frantic, repetitive beats and heavy rapping. But there is something in the fast-paced, interlocking loops, punk attitude and raw delivery that make this music enthralling, and it isn’t long before everyone is dancing. “Adding traditional rhythms shouldn’t be an obligation,” agrees Gafacci, a producer from Ghana who taught himself how to make beats through Youtube tutorials. Although Gafacci started out making beats that were more inspired by American hip hop than Ghanian sounds, his latest project Jowaa sees him combining various African genres to create his own particular version of Ghanian EDM. Late on Sunday night, with his mix of Afrobeats, Angolan kuduro and Afro-house, Gafacci held down the crowd at the Electro Stage, only a few metres away from the swelling waters of the Nile. Further up, in a grassy clearing that over three days had transformed into a mud bath, the main stage welcomed several artists who all incorporate traditional elements into their music, but in very different ways: Faizal Mostrixx, one of Uganda’s most critically acclaimed contemporary dancers who has recently turned to creating music, put on an incredibly visual set, dancing across the stage in long robes and beautiful beaded jewellery. His electronic production focuses on traditional African instruments, with the intent of preserving and developing his cultural heritage. Disco Vumbi, the brainchild of Kenyan hip hop artist, musician and producer Alai K, took to the stage later that night to play his fusion of styles and rhythms. “I don’t want to stick to one specific Kenyan sound because that’s not who I am,” Alai says. “I’m a mix, with heritage from different part of Kenya and even Malawi.” Alai K focuses mostly on Kenyan popular music from the 1950s through to the 1980s, perfectly recreating those vintage disco vibes by merging melodies from the golden era of Kenyan music with modern electronic production. This year the festival counted more than double the number of attendees compared to last year, testifying to the thirst for non-mainstream, original music in the region. 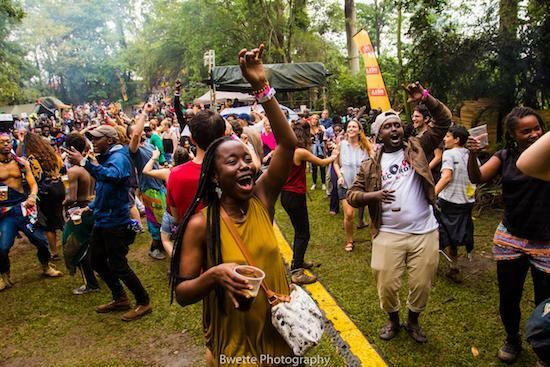 Like any festival that grows so fast, however, Nyege Nyege did undoubtedly suffer some growing pains, not helped by the relentless torrential rains which pummelled us every afternoon and exploded with particular ferocity on Sunday night. But even as tents were washed away and the lack of functioning toilets and rubbish bins turned the Nile Discovery Beach Resort into something resembling the aftermath of a particularly hedonistic illegal rave, attendees and artists left happy, exhausted and with their ears still ringing with a multitude of new sounds.